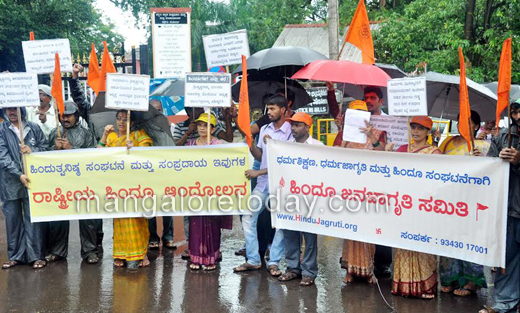 Mangalore, Aug 7, 2014: Various Hindu organisations staged a protest in front of the DC office in the city on August 6, Wednesday demanding a ban on the Kannda film ‘Adhyaksha’ which according to it hurt the religious sentiments of Hindus. The protestors also demanded the cancellation of the 12 per cent reservation given to Muslims by the Chandrashekhar Rao Government in Telangana. Addressing the protestors, Upendra Acharya of Rashtriya Hindu Andolan also sought action against those responsible for offending the Indian National Flag during the Commonwealth Championship. Kumar Malemar, State Vice President of the Sri Rama Sene urged the Censor Board to immediately direct the producers of the Kannada film ‘Adhyaksha’ to make amends in the film. The protestors also warned of protest against the decision to appoint Sania Mirza as Brand Ambassador of Telangana. Vijayalakshmi of Sanathana Samsthe, Jeevan Neermarga of Sri Rama Sene and others were present. The protestors also submitted a memorandum to the DC enlisting their demands.